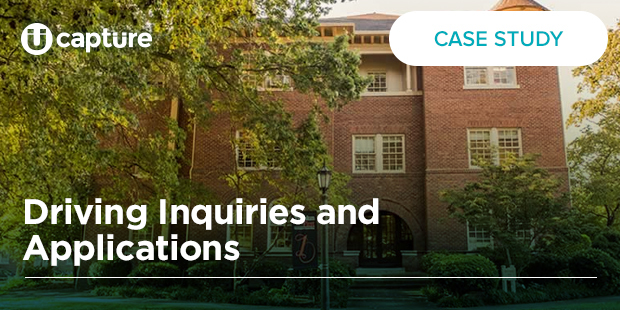 Tusculum teamed with Capture to drive inquiries, international inquiries and applications; promote various academic programs, campus visits and scholarships; and increase deposits. Use Capture Engagement Score (CES) to guide communications strategy unique to Tusculum. Between August 1, 2015 and July 31, 2016, 457 students interacted with a piece of dynamic content. Capture Labs analyzed two triggered emails including a STEM program email that targeted visitors who demonstrated interest in STEM program pages on the site. The other email encouraged visitors to submit their application if they visited multiple admissions pages. This email also included information on how to submit an enrollment deposit, if they are accepted. – After receiving a triggered email, students’ average CAI increased 14% during the next week. Tusculum College is a small, Christian liberal arts school in Greeneville, Tenn., serving 885 undergraduates from 36 states and 19 countries. Tusculum is the oldest institution of higher education in Tennessee.